This 6 1/2" x 5" book by author Randy Alcorn is a mere 120 pages long. It's tiny, but it packs a punch. Contrary to the title, it is no secret that it is a joy to give. Anyone who has a child should know this. The child seeks to find and parents seek to give. It starts out by giving funny faces to entertain and amuse. Our joy is increased by the tiny smile we receive in return for our antics. The older they get, the more they want and the more we want to give. The Bible correctly assumes that when asked for bread we would not choose give our children stones. And how much more would our God give to us? Joyfully. That is our earthly challenge as well: To give and give what we have joyfully. Alcorn starts off by saying that this book isn't meant to produce guilt (and it does not). If anyone was feeling pressured or guilty after reading this, I would suggest that they have a personal problem that they need to go to God about. 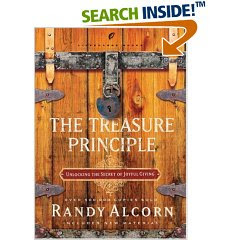 This book merely "unlocks" some truths about giving that are important for us, as Christians, to know. He starts with the fact that "you can't take [your treasures] with you" when you die. Everything you own stays behind. He mentions the verse which we should all be well-familiar with, "For where your treasures are, there your heart will be also." This book could be repititious and fall on the tail end of many other books about giving. I would say that Alcorn makes the principle and idea of giving very practical though. He doesn't guilt to get you to open your pocketbook. He doesn't insist that you sell all that you have and/or pretend that you don't have anything. He encourages you to earn a good living. He stresses the importance of providing for one's own family first. He just suggests that you redirect your excess funds. If you think about it, this is what the government is offering to do FOR you on your behalf. This just beats them to the punch. If you take your excess and give it away, we would have need of far fewer programs for the government to fund. If we truly did take care of our orphans and widows, for example, and we took care of them willingly (joyfully) then there would be no need for laws which make us do this whether we would want to or not! The basic premise is this: If you can't keep your treasures, you should put them where they can be eternally enjoyed and where they will be eternally profitable. He challenges you to seek ways to put your money to good work-- God's work. Is there a missionary you can support? A mission? A meal you can provide to a family in need? A short or long term housing situation for a family? An orphan to adopt? A scholarship you can provide to a church led retreat of some sort? Is there some place where your money can be put to good eternal use? Use your imagination. Pray about it and see what God would have you support with your excess funds. That's Alcorn's plug, and I think it makes sense. That pretty much sums up the challenge that Alcorn lays out in this book. It may require rethinking a budget for the reader, I don't know. Likely it will effect different people in different ways. It IS worth the time to read it (an hour or less) for the challenge. O have not been able to access Joshua's page at all. Can you help?